With an objective to fulfill the ever-evolving demands of our clients, we are engaged in offering a wide assortment of Anti Acne Daily Face Wash.
Anti Acne Daily Face Wash is a cleanser with all natural ingredients ans is very gentel on the skin. 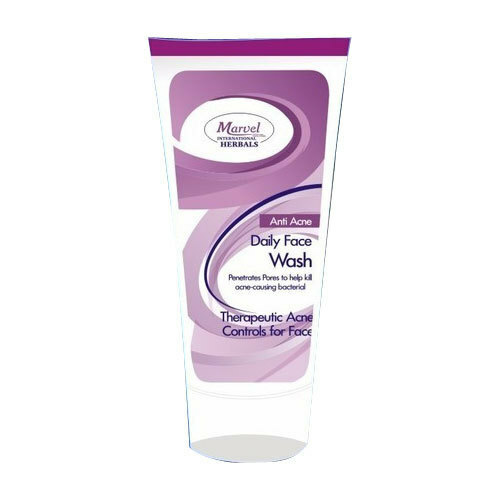 Anti Acne Daily Face Wash also contains salicylic acid which fights acne and makes your skin acne-free. we think its a "must try" product for acne-prone skin. Actually we will also go out on a limb here are say that in my opinioon this is the best face wash for acne. Established as a Sole Proprietorship firm in the year 2009, we “Marvels International Herbals Company” are a leading Manufacturer of a wide range of Face Wash, Hair Conditioner, Bath Soup, etc. Situated in Surat (Gujarat, India), we have constructed a wide and well functional infrastructural unit that plays an important role in the growth of our company. We offer these products at reasonable rates and deliver these within the promised time-frame. Under the headship of our mentor “Mr. Kamlesh Kumar”, we have gained a huge clientele across the nation.